Italy's corrupt and inefficient public services mean that some of the country's most important archaeological sites are being forgotten or damaged. The Sybaris Project is trying to change that. The ancient site of Sybaris in Calabria, Italy. Wikipedia/AlexanderVanLoon. Public domain. Having razed the city, in 510 B.C. its enemies flooded its ruins by – Strabo writes – diverting the waters of a nearby river onto them. 2,523 years later, other enemies caused the same river to flood the same ruins, leaving a thick layer of mud and debris throughout. The city is rich, refined and – legend has it – dissolute. The city is Sybaris, which gave us the adjective ‘sybarite’. Founded as an Achaean colony in the VIII century, it lies on the Ionian coast of present-day Calabria, in southern Italy. In 510 B.C. its enemy was Pythagoras’ Croton, a rival Greek city laying further south on the same coast. Two and a half millennia later its enemies were illegality and administrative paralysis, which allowed the embankments of the river to deteriorate and its floodplains to be filled with illegal orchards and citrus groves: provoked by heavy rains in January 2013, the flooding of one of the Mediterranean’s most important archaeological sites was as devastating as it was predictable. The plain that Sybaris controlled was fertile, though, and the trade routes at whose juncture it stood, profitable. Hence in 443 B.C. Athens decided to found a new city on the same site. The expedition that Pericles dispatched included the philosopher Protagoras and the architect Hippodamus of Miletus: the limpidly rational urban plan he designed is noted in classical literature and is now partly visible, closely resembling that which Hippodamus himself conceived for the Piraeus, in Athens. The new city, named Thurii after a nearby source, flourished. The orator Lysias moved there, for instance, and the historian Herodotus, who signed himself as a Thurios and according to legend was buried at the edge of the main square (the agora, yet to be excavated). The city declined after Hannibal took it during the second Punic war, but rose again as a Roman colony, named Copia (‘plenty’) by reason of the wealth of the plain. In contrast, since January 2013 Italy’s public institutions have only managed to remove the mud from part of the archaeological site: intolerably, not one cent of the €5 million allocated shortly after the flood to repair the embankments and floodplains of the river has yet been spent. Next winter the Krathis – now named Crati – could flood Sybaris yet again. 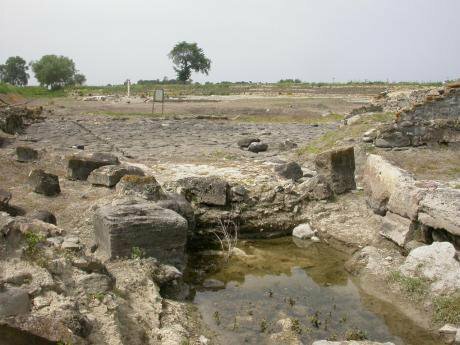 Such disregard for a site of capital importance for the study of antiquity, and a crucial resource for a vast area of one of Italy’s poorest regions, has prompted a group of volunteers to organize a response. The group, which the authors are part of, is led by the archaeologist who conducted the main excavations at Sybaris – Pier Giovanni Guzzo, formerly superintendent at Pompeii – and includes academics and intellectuals from Calabria, and outside experts. The aim is to exercise public pressure on the institutions responsible until they secure the river and restore the site. The catalyst for this programme was a recent proposal by Fabrizio Barca, who was minister of national cohesion in the 2011–13 Monti cabinet, at the end of whose mandate the flood occurred and the €5 million emergency plan was approved. The ideas he outlined depict an attempt at reforming politics in Italy. The aim of the work we undertook at Sybaris is broader that the restoration of the site, in fact, and runs parallel to ten other projects across Italy. This effort stems from the hypothesis that Italy’s public institutions are inefficient chiefly because they have become ever more isolated from society. Their isolation, in turn, is due to the fact that political parties have largely lost their ability to coordinate and even collect the policy demands and proposals that are dispersed across the nation, as well as their capacity to exercise pressure on the institutions in the name of the public interest (rather, of their own declination of the public interest, in competition with those of other parties). Italy’s political parties have mostly become centralized electoral machines, subservient to their leaders holding public office and unable to hold them to account. Centred on the lowest local articulations of the Partito Democratico, therefore, this initiative seeks to equip this party with the means and the incentive to turn its attention back towards society and resume the work of politics. The Sybaris project was promoted by the local sections of the party, and began last May (our strategy is available here, in English, and donations can be made here). We are now close to completing an extensive programme of hearings – led by Antonello Pompilio, who coordinates the local party sections, and by the economist Domenico Cersosimo –, through which we collected the analysis and suggestions of national and local administrators and politicians, entrepreneurs, trade unionists, civil society representatives, intellectuals and other citizens. On this basis we shall select a few actions – beside securing the archaeological site – on which Calabria’s Partito Democratico pledged to concentrate its efforts over the next months. They shall disseminate information about the performance of the public institutions, through a dedicated website, and then use this to organize political actions, such as public pressure or petitions. We thus aim also at strengthening the networks through which civil society’s vital forces can cooperate and become a more effective and demanding interlocutor for public institutions: indeed, our long-term objective is to stimulate an acceleration in the democratic and economic development of the plain of Sybaris. This territory hosts a promising agrifood sector, specialized mainly in the production of high-quality peaches and citrus fruit. Remarkable hilltop medieval villages rise below the massif that closes the plain from the north, whose white gorges and rare autochthonous pine trees (the Pinus leucodermis) are protected by a national park. And at the centre of the plain lie the 500 hectares of the archaeological site, most of whose wealth is yet to be unearthed, and a national museum exhibiting the findings. What prevents this potential from flourishing, as it did in antiquity, is bad politics, administrative inefficiency, corruption, organized crime. These are forbidding obstacles, common in varying degrees to the whole country. Our conviction is that organized political action by the many vital forces that have an interest in democratic and economic development can overcome them in the long run: our project seeks to move a step in that direction. If we fail, we shall have learnt more about Italy’s problems. If we succeed, we shall be able to look at its prospects with greater optimism. Do come and see Sybaris: dissolute, perhaps, but interesting.